The style of music known as “psychedelic soul” enjoyed an all-too-brief heyday in the late 1960s. Deftly fusing elements of African American soul and the dreamier end of psychedelic rock, the genre was exemplified by artists such as Sly & the Family Stone and The Chambers Brothers. But the incredibly rich and varied musical landscape of the era meant that any given style didn’t enjoy prominence for very long; something newer always came along to supplant it. 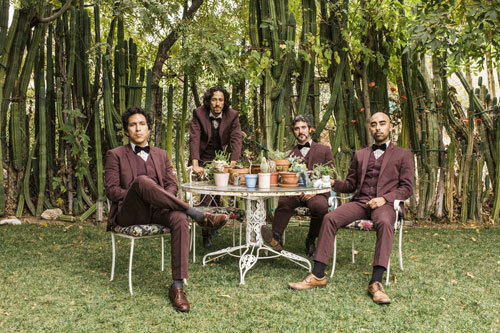 In the 21st century, a southern California group called Chicano Batman has developed its own distinctive, modern and original musical personality, based in large part on the influence of psychedelic soul. Yet Arenas and his band mates aren’t trying to duplicate the music of days gone by. “We’ve never really seen ourselves as part of that image,” he says, “but only time can tell.” Instead, the music of Chicano Batman evocatively taps into the positive vibes of psychedelic soul. The quintessential Los Angeles four-piece band Chicano Batman formed nearly a decade ago. The group released its self-titled debut in 2010; after following up that disc with two EPs, the band returned in 2014 with Cycles of Existential Rhyme. After a third EP – 2015’s Black Lipstick – and a single, Chicano Batman released Freedom is Free in March. And in yet another nod to the past, Freedom is Free was recorded the old-fashioned way: using analog tape. “We’ve recorded our previous albums digitally,” Arenas says. “There’s nothing wrong with digital; it has its advantages, definitely. But all of the records we have in our collections – Earth Wind and Fire, James Brown, Janis Joplin and anything that we have – all that stuff was recorded in analog.” And there’s something about the warmth and directness of recording onto tape. While Arenas insists that Chicano Batman is not a politically-focused group, there’s no mistaking some of the lyrical messages on Freedom is Free. The original motivation for putting the band together was simple and straightforward, say Arenas. “Get a name on the band, get a project going and then just play. You know, just jam on some songs.” But creativity never exists in a vacuum, and the group was aware of larger issues in American society. “We’ve tried to bring a lot of harmony to every city that we play and in all of the music that we bring, but I think we kind of came to a breaking point,” Arenas admits. And that led to the group’s music taking on a more topical nature. Chicano Batman focuses on the values that connect people, not the ones that encourage division. In February, White House Press Secretary Sean Spicer announced, “The earth is a very dangerous place these days.” Arenas seeks to put that kind of broad-brush statement into perspective. “Volcanoes are dangerous when they erupt,” he says. “Carbon monoxide is dangerous in the long term. There are a lot of systematic dangers, but there’s no enemy out there. When the band’s lead vocalist Bardo Martinez sings, “Nobody cares to extend a greeting aid connecting lands,” he’s weighing in on immigration policies that involve the planned construction of a massive Berlin-style wall along the U.S.-Mexico border. Still, Arenas believes that “a lot of policies – especially a lot of these new executive orders – are coming out of a fear for the unknown.” But “Freedom is Free” conveys a definite sense of hope, and a clear focus on the ideas of togetherness. “No amount of negativity can put a dent in me,” Bardo sings. “Here we are talking about the world and our political atmosphere,” says Arenas, because “our ideologies are us as people.” But the band – whose music combines a late 1960s psychedelic soul vibe with elements of tropicalia and rock – isn’t about polemics; there’s a healthy sense of humor emanating from the group, beginning with its name. “Chicano Batman was just a pet name that [Bardo] had given himself for his compositions,” Arenas explains.